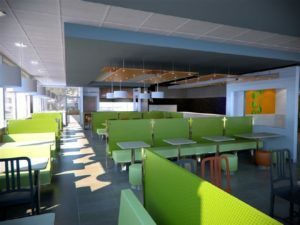 From concept to completion, ISI Interior Systems consults, designs, builds, and installs interiors unlike any other. A creative group of designers and artists bring strength and consistency to their client’s brands. Specialized project managers and market managers carefully guide project goals, timelines and budgets. Extensive manufacturing facilities and certified installers ensure flawless execution of every element. And after opening day, clients are supported by ISI’s expert customer service team. Their commitment is to create extraordinary interiors with excellence. 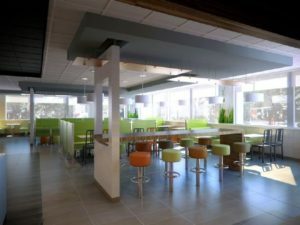 ISI was given the opportunity to create a green design for a chain store location, building upon the success of Holistika, ISI’s original green design. It features 3form dividers, pvc free upholstery and recycled wood. Check out the new 3Ds of this project-in-progress! Complete Turnkey Service From concept to completion, ISI consults, designs, builds, and installs interiors unlike any other. Industry Leaders Different clients need different solutions, and they are able to deliver. Creative Design At ISI, they have an unyielding passion for letting our imaginations run wild, while keeping tight reins on schedules and budgets. Customer Knowledge Understanding the unique goals and challenges of their client is the first critical step to creating truly inspired interiors.